It must be replaced when necessary, and should not be cleaned and reused. You can clean the filter when inspecting the air cleaner element. Clean the filter by using compressed air. 1. 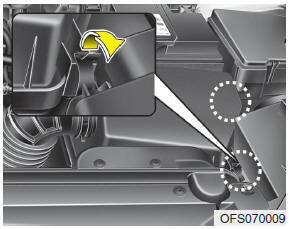 Loosen the air cleaner cover attaching clips and open the cover. 2. Wipe the inside of the air cleaner. 3. 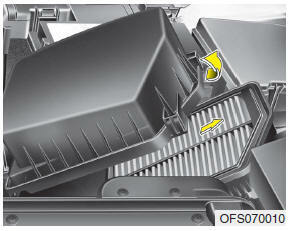 Replace the air cleaner filter. 4. Lock the cover with the cover attaching clips. Replace the filter according to the Maintenance Schedule. • Do not drive with the air cleaner removed; this will result in excessive engine wear. • When removing the air cleaner filter, be careful that dust or dirt does not enter the air intake, or damage may result. • Use a HYUNDAI genuine part. 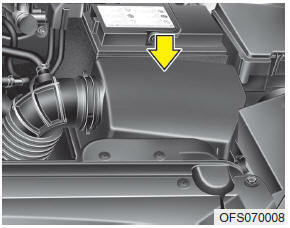 Use of non-genuine parts could damage the air flow sensor and engine.